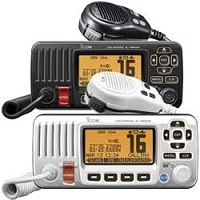 The M506 fixed mount, Class D DSC marine VHF radio is almost identical in size to the M504A, but with a larger dot-matrix display, a sleekly designed speaker microphone, a louder 10-watt audio output from the front-facing speaker, and the same easy-to-operate user interface as ICOM’s M424, M92D, M400BB and CommandMic IV™. It features active noise canceling, “Last Call” voice recording, and compatibility with the optional CommandMic IV™. 25W hailer with a listen function. 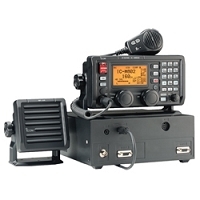 With an integrated AIS receiver, this model of the M506 can show AIS vessel traffic information on the display. The AIS target call function allows you to easily set up an individual DSC call. The Plotter, Target list and Danger list can be toggled on the display. NMEA 2000 interface and a front-mount microphone jack. 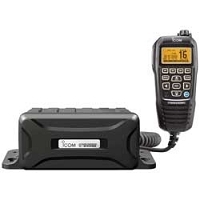 Integrated AIS Receiver: With an integrated AIS receiver, the M506 can show AIS vessel traffic information on the display. The AIS target call function allows you to easily set up an individual DSC call. The Plotter, Target list and Danger list can be toggled on the display.